Wow what a fabulous threatening sky!! I have loved all your and Taffy's Palouse images!! Another Fav! I love the dark, cool, moody sky contrasting with the warm fields. There doesn't look like much shelter from the rain. Good shot. You captured the feeling of ominous weather so well in this, and I do like the curves of the landscape, with their embedded curving lines. I'm a sucker for lines in fields, and this looks amazing with that dramatic sky. A sky with a sense of foreboding - Very dramatic! Doesn't look good, (the weather) :-) Great capture. Oh gosh, there are threatening skies and very threatening skies. No question which one this is. I just love this shot with the goldy stubble and tyre tracks on those rolling hills agains that utterly fab sky. The clouds look rather ominous. The black of the clouds is such a grand contrast to the browns of the paddocks. looks gorgeous. hope the storm wans't too bad! 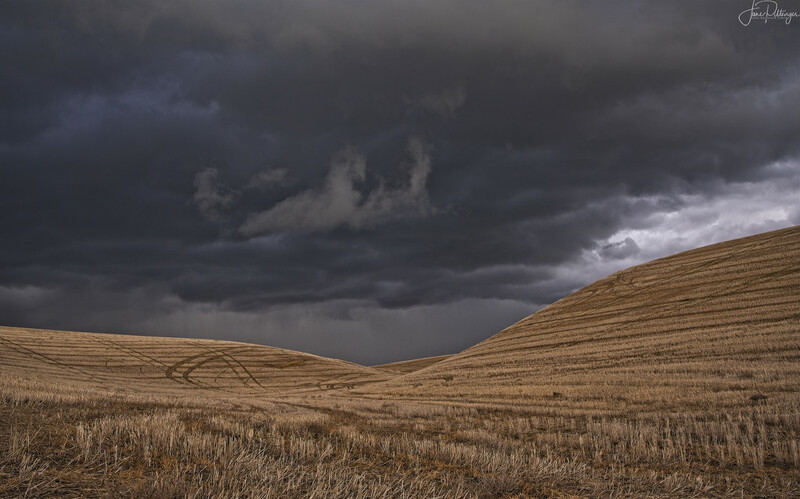 Your Palouse shots are just stunning. Love this one on black - wonderful textures! Fav.